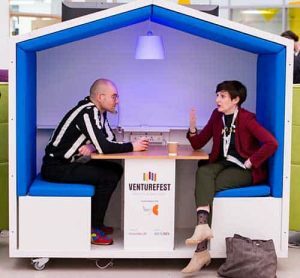 A highlight of the region’s tech calendar, Venturefest returns to Bristol on Tuesday 17 October. The social, legal and regulatory issues around creating smart cities have been debated during events held in the last eight months. Now Venturefest will bring this together to see how the tech community can play its role in the transformation of homes, transport, work and health for a smart city just ahead of the Festival of the Future City debate series. Get in early for the workshops. Developing your business model, getting the most from data, and advice on funding streams are on offer to boost your skills but must be booked in advance. Allow time for the marketplace that will showcase local and national businesses. Exhibitors are diverse and include Slide, Immersive Labs and Neighbourly. Among 40 speakers you’ll hear from the new West of England Mayor, Tim Bowles on developing a digital strategy as part of his plans for the region and Innovate UK’s Deputy CEO’s Kevin Baughan on his support for the sector. Connect and share with civic leaders on planning and implementing smart cities. Across the layers of making smart cities there is a role for local, national and global players. It’s challenging and covers everything from big data and analytics to energy grids and mobility. Could you back a start-up or scale-up? Entries for the Silicon Gorge pitching event are now closed but we can fit in a few more potential investors. Contact abby@techspark.co if you’re interested. Don’t forget to register – and follow the event at @venturefestbb.